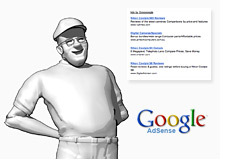 Google is apparently going ahead with plans to make their Adsense ads less "clickable." Right now, if you click on any area of the Adsense ad, including all of the empty space, you will be counted as a click and will be taken to the advertiser's page. As a result of this, there have been quite a few "accidental" clicks where a user didn't really mean to click on the ad. This would result in less valuable clicks for the advertisers, which is why Google is making the change. So now, the only parts of the ad that are going to be clickable are the Title of the Ad, and the URL which sits below the description. The blogosphere is going nuts about these changes, with many bloggers crying foul. They are missing the point. In the end, advertisers pay for all of our bills. If advertisers aren't happy, they will pull their funds and advertise elsewhere. Why wouldn't Google want to increase their ROI as much as possible? This will only result in more ad dollars flowing through to bloggers in the end anyways. Why should an advertiser pay for an "accidental" click. In my opinion, these changes make sense and while there may be a temporary drop in revenues as a result of these changes, in the long run, it will benefit everybody, as earnings per click will only rise as advertisers find their ROI increasing, and by default, they will then increase their bids. Makes perfect sense to me.